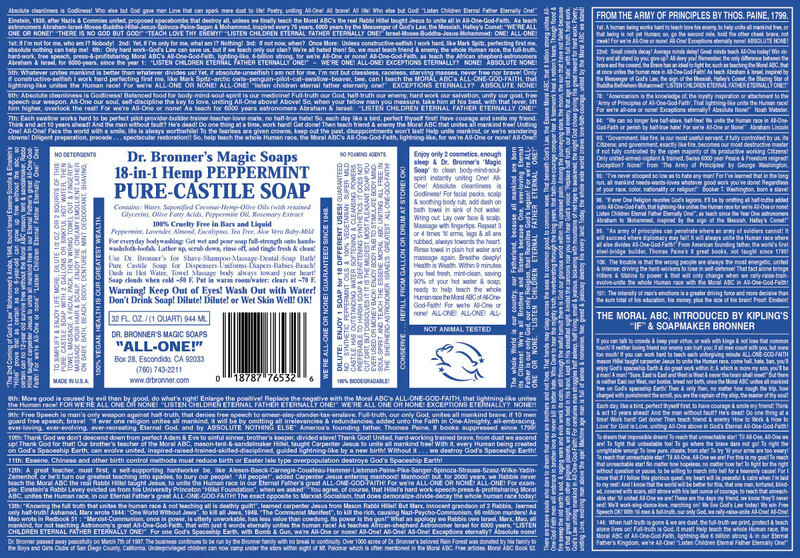 I'm a fan of Dr. Bronner's Peppermint 18-in-1 Pure Castile Soap. I've used it off and on for decades. I like my soap like I like my food -- it needs to burn a little. And it's truly a simple multi-purpose product. Sinuses clogged? Pour a little on a washcloth and drape it over your face while in a hot shower. It's like a nuclear blast in your nose holes. It's good stuff. Smells great, wakes you up, and a bottle lasts forever. 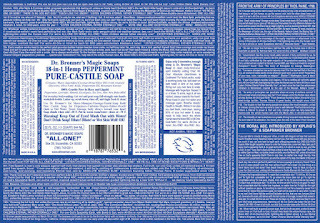 Anyone who has used Dr. Bronner's soaps has noticed that the label is covered with what appears to be the ramblings of a religious madman. I never really paid a whole lot of attention to it. The small snippets I've perused here and there seemed to be part of the charm -- as if Dr. Bronner was perhaps a crazy hippie who happens to make awesome soap. I never really looked into it. I knew nothing at all about Dr. Bronner. This week, while showering, I decided to read the label a little more closely (it was a long shower). It reads like the carnival barking of a schizophrenic street preacher-slash-soap salesman. It's a strange mix of homeopathy, new age rhetoric, science fiction, Evangelical Christianity and Judaism. "THE 2ND COMING OF GOD'S LAW!" Mohammed's Arabs, 1948, found Israel Essene Scrolls & Einstein's "Hillel" prove that as certain as no 6-year-old can grow up free without the abc, so certain can no 12-year-old survive free without the Essene Moral ABC the mason, tent & sandalmaker, Rabbi Hillel taught carpenter Jesus to unite all mankind free in our Eternal Father's great All- One-God-Faith! For we're All-One or none: "Listen Children Eternal Father Eternal One!" Absolute cleanliness is Godliness! Who else but God gave man Love that can spark mere dust to life! Poetry, uniting All-One! All brave! All life! Who else but God! "Listen Children Eternal Father Eternal One!" More good is caused by evil than by good, do what's right! Enlarge the positive! Replace the negative with the Moral ABC of All-One-God-Faith that lightning-like unites the Human race! For we're All-One or none! As Mao found in Redbook '51, "Marxism once in power, is unworkable! Has less value than cow dung! Its power is the gun!" Khruschev added, "Without profits, farmers won't deliver food, we starve!" There are brave souls who dare to dream that men are brothers and not foes, That hands may clasp across the seas to common good, to common woes. That beneath God's Law, the Essene Moral ABC, that 6 billion strong unites All-One- God-Faith men will embrace in brother-love to never kill in bitter hate. Who dare to hear the mighty truth, reverberating through long years, that faith- love-courage conquer fear & teamwork heal a nation's tears. Though flood & fire sweep the old earth's sod, & raging wars and evils wreck its calm, still through the awful tumult there is God our glorious world within His upraised palm. Among the journeying stars, the moon, the sun that have not failed because of that great might, with other pilgrim planets, we are one held in His hand, kept in His steadfast sight. Amidst the cannons roar you can hear God's voice: "Replace half truth, our real enemy, that age old hate" with full truth, hard work, God's Law uniting mankind in All-One-God-Faith! For centuries man struggles half asleep, half living, small & jealous, bickering with mountains of red tape to be awakened, the night God chose giving His great reward for hard work: Poetry, uniting Love, evolving man above the ape! Machine age man is full of sense & nonsense, fear, greed & jealousy, destroy his every land; Today, this whole wide world craves love-faith-courage united by the Moral ABC we stand! It's unclear whether anyone but Dr. Bronner understood all of what is printed there. That's the way it is with a philosophy of peace, unity and environment that simultaneously pays tribute to the qualities of Jesus, Karl Marx and Mark Spitz. "He never thought small," said his son, Ralph, a longtime resident of Menomonee Falls who taught English and reading at Milwaukee's Muir Middle School for 32 years. "He was a brilliant soap chemist trying to unite the world." Bronner wasn't a doctor, if that makes any difference. Growing up in his family's business in Germany, he gained a soapmaster's degree, which he considered the equivalent of a doctorate. He wasn't really a rabbi, either, though he sometimes called himself that in later years, using the meaning of teacher. He was Jewish, all right, even though he had his three children baptized Lutheran. Two sons and a daughter were born when Bronner was living in Milwaukee, but that was before he was forced into an Illinois mental institution and long before he habitually greeted visitors in California clad in leopard-print bathing trunks. Bronner, among the biggest self-promoters in the nation, and blind the last 30 years of his life, was a self-proclaimed visionary. Bronner has had an eventful life. The son of a Jewish German soap maker, he emigrated to the U.S. and pleaded with his father to do the same when the Nazis came to power. The old man refused. One day Bronner got a postcard with the words, "You were right. — Your loving father." He never heard from his parents again. Later Bronner was arrested while trying to promote his plan at the University of Chicago and was committed to a mental hospital. He escaped three times, finally fleeing to California in 1947. He's been there cranking out soap and soap labels ever since. Despite his eccentricities, Dr. Bronner has built his soap company into a prosperous concern, mostly by sheer force of personality. In the early days he would set up a table at health food conventions. If a dealer strayed within ten feet, Bronner would pounce and not let go until he'd gotten an order. But things didn't really take off until he was discovered by the counterculture during the 60s. With the aid of his sons Jim and Ralph, who handle production and sales, he currently sells some 400,000 gallons of liquid soap and 600,000 pounds of bar soap a year. He says he's now worth $6 million — not bad, he notes drily, for somebody who's supposedly nuts. The Straight Dope article was written before Dr. Bronner's death in March of 1997. His family continues the business, and the inspired writings of the doctor remain. The family has vowed to leave the labels untouched as a memorial. According to the Jounral-Sentinel, one particular soap user, "who adopted Bronner's religion and his punctuation, wrote: "Until I read one of your soap labels, I was an atheist. Now I have found the words in which I can believe!"" So what are your thoughts on the continued use of the soap? ...Just out of curiousity. I would struggle with that, personally. Interesting good luck with your marketing.